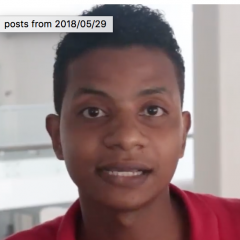 Sacur Quiñones Medranda is a member of Centro de juventudes de Esmeraldas (Youth Center of Esmeraldas), a human rights organization in Esmeraldas, Ecuador that works with children, teenagers, and the LGBTI community. One of its primary activities is the weekly radio program La Calle Habla (The Street Talks), a place for discussion and debate about issues facing their community. The following post is based on transcripts of an interview with Sacur as he analyzes word clouds for the words “Esmeraldas and Derechos (Rights).” Esmeraldas is a city affected by earthquakes as well as conflicts along the border it shares with Colombia. La nube que escogí en este taller se llama Esmeraldas + Derechos. Bueno una gran galería de palabras, pero me impactó una que menciona atentado, porque da una imagen algo conflictiva en extremo de lo que es la provincia. Debería haber más palabras, porque Esmeraldas no es conflicto. Cierta área de este territorio se encuentra en eso pero no es la realidad de toda la provincia, entonces considero de que debería enfocar más en lo versátil y positivo que existe acá en nuestra tierra. The word cloud that I chose was Esmeralda + Rights. There are many words, but one that impacted me the most was ‘attack’ because it gives an extreme image of conflict in the province. There should be more words represented because Esmeraldas is not conflictive. Yes, there are some areas that are in conflict, but that is not the entire province. I think there should be more focus on the versatile and positive aspects that exist in our land. How should the city of ‘Esmeraldas’ and ‘rights’ be represented in the media? Diversidad, crecimiento, derecho, pluralidad, versatilidad, amor, paz, unidad y muchas que encuadran en la identidad de nuestro pueblo. Diversity, growth, rights, plurality, versatility, love, peace, unity, and other [words] that fit within our town’s identity. What words should a word cloud for ‘rights’ and ‘Esmeraldas’ have? Riqueza, no está presente ahí pero considero que debería estar allí, porque es un lugar rico en todo ambiente, entonces considero es que hay que darle realce a ese a ese detalle de Esmeraldas, una provincia muy rica. Richness is not represented, but I think it should be because [Esmeraldas] is a rich place in every sense of the word, so I think that should be highlighted. This is part of a Rising Frames series developed in close collaboration with the organization El Churo based in Quito, Ecuador. They organized a workshop held on May 4, 2018 in Esmeraldas, Ecuador that brought together representatives from various collectives and groups to examine how they or issues they care about are represented an Ecuadorian media collection and created stories in response to that representation.